Play is down to the final two players in Event #5 $365 Monster Stack. It's a very close match as Daniel Pickering has a very slight lead with 4,340,00 to James Karos's 4,020,000. The two are taking a quick bathroom break before resuming play. 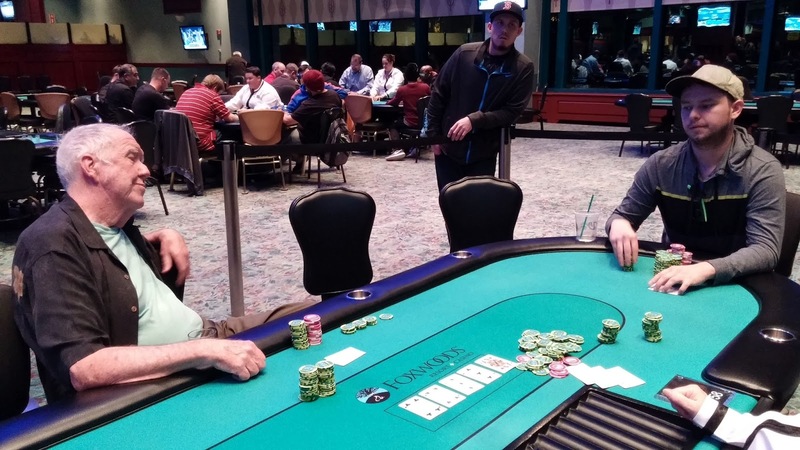 On a [Ks][7s][5c][2c] board with over 1,000,000 in the pot, James Karos moved all in for over 1,400,000 and Tom Dragone made the call. James held [Kc][9s] for top pair, and Tom would need to improve with his [9c][7c]. The river fell the [Qd], awarding James the double up. On the very next hand, Tom Dragone moved all in with K-3 and was called by Daniel Pickering with [9h][9c]. There was a king in the window, but the flop fanned out [9s][Th][Kc] to leave Tom drawing thin. The [6d] sealed his fate, and when the meaningless [2c] hit the river, Tom was eliminated in 3rd place. He will collect $12,570 for his efforts. The board read [4c][4h][3d][3c] and James Karos check raised Daniel Pickering's 250,000 bet. It was 650,000 more chips to call, and Daniel put them in after a long pause. The river landed [Qh] and James instantly bet out 1,000,000 roughly half his remaining stack. Daniel briefly thought and made the call. James confidently flipped over pocket aces, but Daniel had gotten lucky on the turn with his ace trey. After the hand, Daniel had 6,200,000, or roughly 75% of the chips in play. 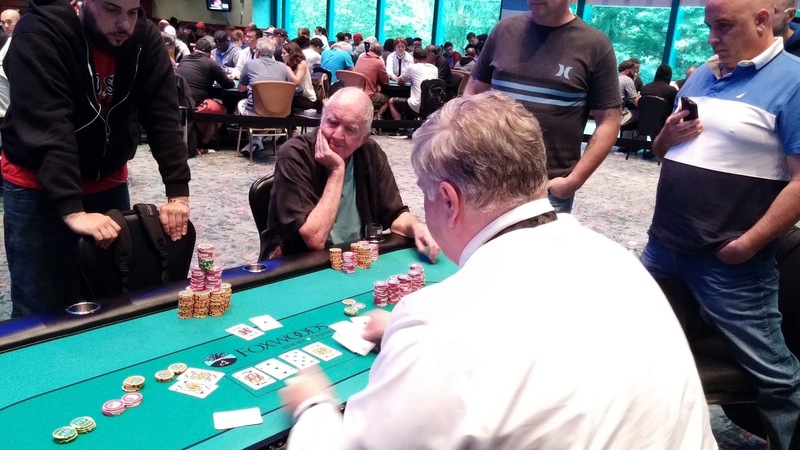 While Event #5 plays three handed, two other ring events are in play. Event #6 $365 NLH has just reached the final 18 players and are now redrawing for seats at the final two tables. 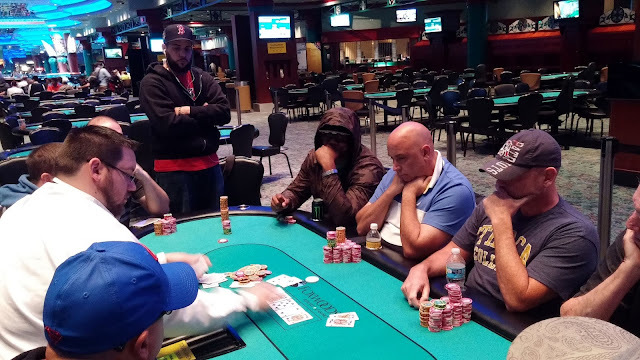 Event #7 $365 PLO has just reached the final table of 10 players, but is still outside the money. The top 8 players will make the money. Andrew Kaplan was all in preflop holding [Ac][7d] and was up against Daniel Pickering's [4s][4h]. The [2h][2s][2c] gave Andrew one additional out, but the [9d] turn and [5s] river gave Daniel the winning full house. 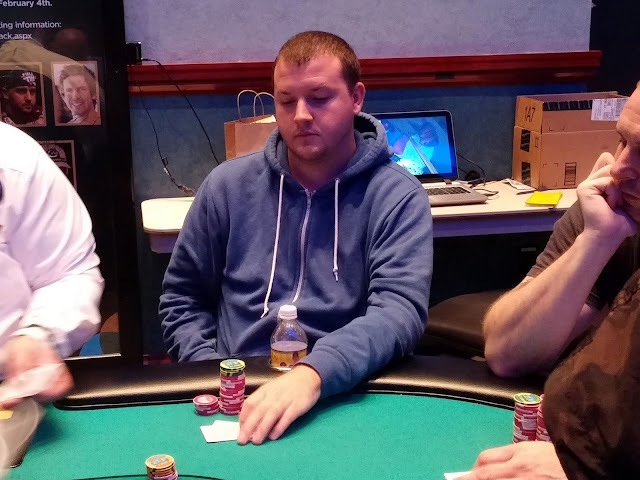 Andrew will exit Event #5 in 4th place, good for $9,288. After being crippled by James Karos the previous hand, Todd moved the rest of his stack in with [Kd][9d] and was called by [Ad][5s]. The [5h][7h][8d] gave Todd a gutshot, and the [Tc] on the turn gave him an open ended straight draw. The [2c] river kept the pair of fives in front, and Todd Bartlett will exit Event #5 in 5th place, good for $6,989. 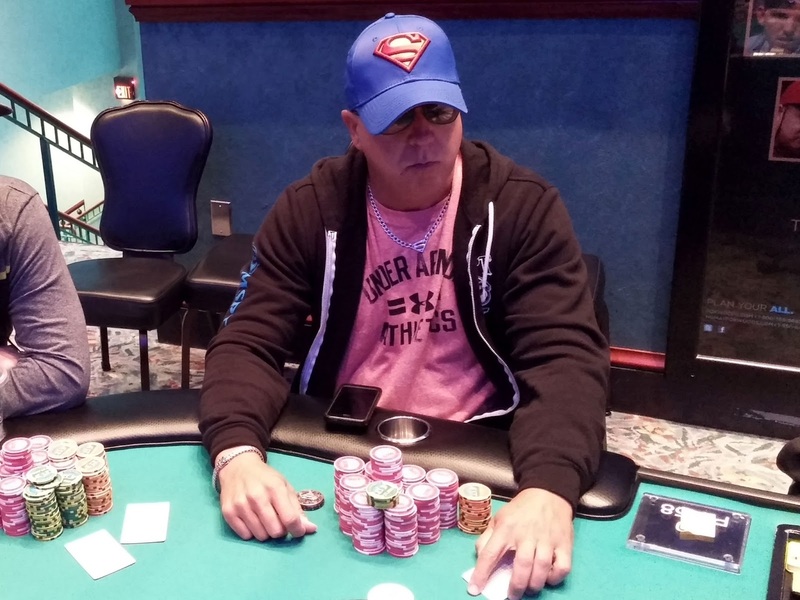 From the button, Todd Bartlett raised to 175,000 and James Karos moved all in for 1,090,000. Andrew Kaplan folded his big blind, and Todd snap called with [Ad][Ac]. James was disgusted as he tabled his [As][9h]. The [4s][2c][2s] fell, and a player called for a spade to hit the turn for a sweat. A spade did hit when the [Qs] fell on the turn, and amazingly the [8s] hit the river to complete the runner-runner straight. 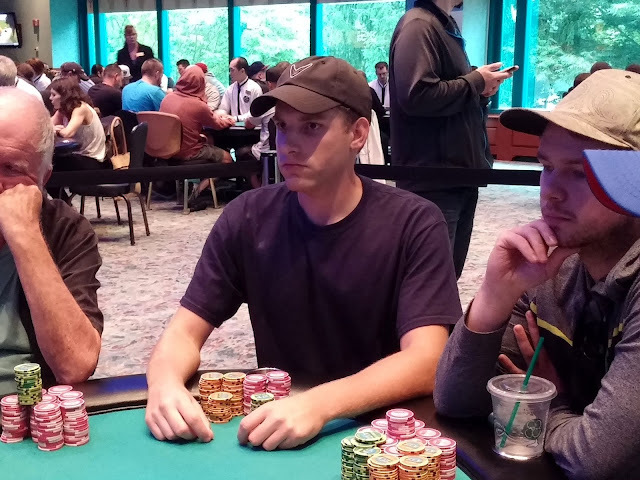 Todd could only say, "Every time" as he pushed over all but 300,000 of his stack to James. 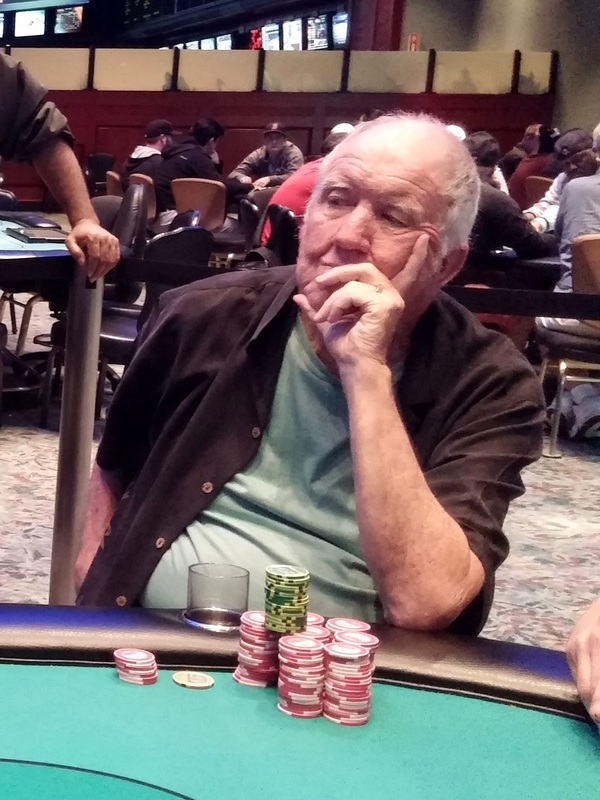 Noel Dorsett moved all in from the button and was called by Andrew Kaplan in the big blind. Noel was ahead with his [Ac][8c] against [As][2d], but the [9d][2c][5s] flop chaned that. Noel would need to catch an eight to survive, but the board ran out [Qh][Qc] to give Andrew the winning two pair. Noel will finish Event #5 in 8th place, good for $3,268. Nick Major was all in holding [Kd][Js] and was up against Bob Ricciuti's [Ad][Ks]. The [9c][Td][9s] flop gave Nick a gut shot to go with his live card, and the turn [8s] gave him more straight outs. But the [4c] river was a blank, and Bob's ace high will hold up. 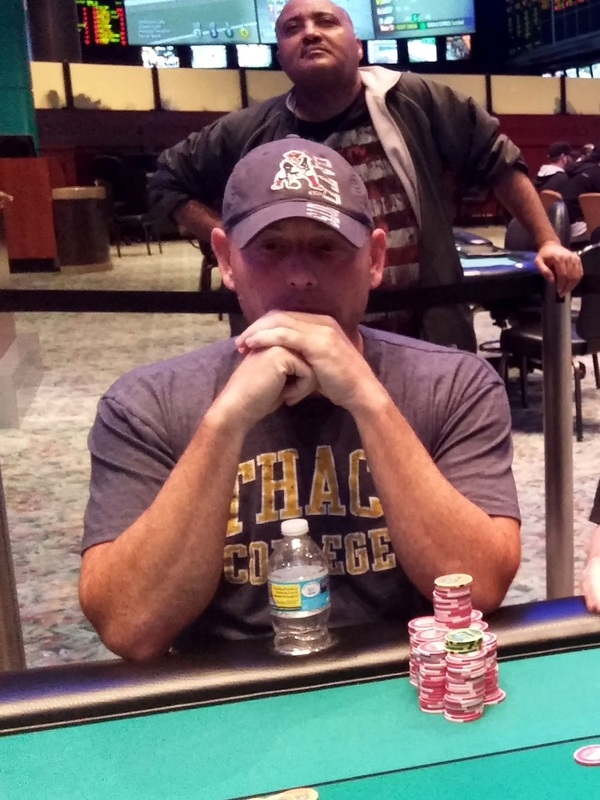 Nick will exit Event #5 in 9th place, good for $2,636. Neto Aristoteles moved all in preflop holding [As][3s] and was called by a player holding [Jd][Jc]. Neto flopped an ace on the [Ac][Qc][8c] flop, but his opponent had a flush draw and a draw to a set. The [2s] was no help, but the [Jh] on the river sent Neto to the rail in 10th place. He will collect $2,111 for his efforts. 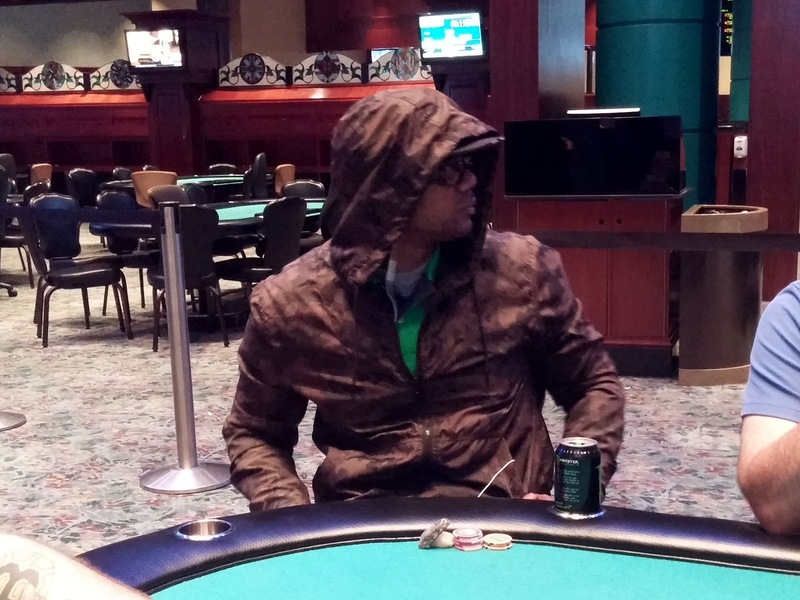 On a [Qh][6s][Ts][As] board, Victor Paulino check raised all in on and was called. Victor's [Kd][Jc] was in front, and he couldn't believe his opponent called him with [2s][2d] as they had virtually equal stacks. The [5s] hit the river to give Victor's opponent a flush, and Victor will be brutally eliminated in 11th place for $2,111. 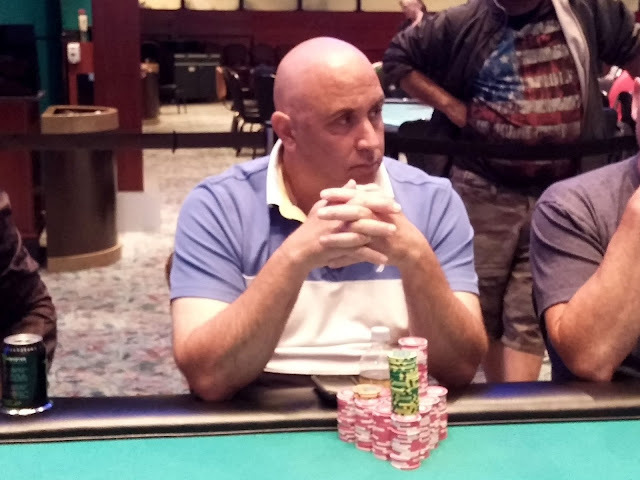 Bob Ricciuti was involved in a three way all in holding pocket aces. John Iraj was all in for less holding [Qd][Qc], while Aristoteles Neto held [Ac]]Kd] and had Bob covered. The board ran out [Jc][3s][8h][Jh][2h], keeping Bob's aces in front. John will exit the tournament in 12th place for $2,111, while Bob will more than double up. He now sits on almost 1,400,000. Day 2 levels will be 50 minutes, resuming at 1pm. There is a dinner break after Level 12 (approximately 5:20pm). The day will conclude at approximately 12:40am. Registration will remain open until the start of level 9 (approximately 5:50pm). Levels 1-10 will be 30 minutes. Remaining levels on Day 1 will be 40 minutes. There is a dinner break after Level 10 (approximately 6:20pm). The day will conclude at approximately 1:40am. With 10 minutes left on the clock, a card has been drawn. Six more hands will be played before the 28 remaining players will bag up for the night. The survivors will return at 1pm EST to play down to a winner.